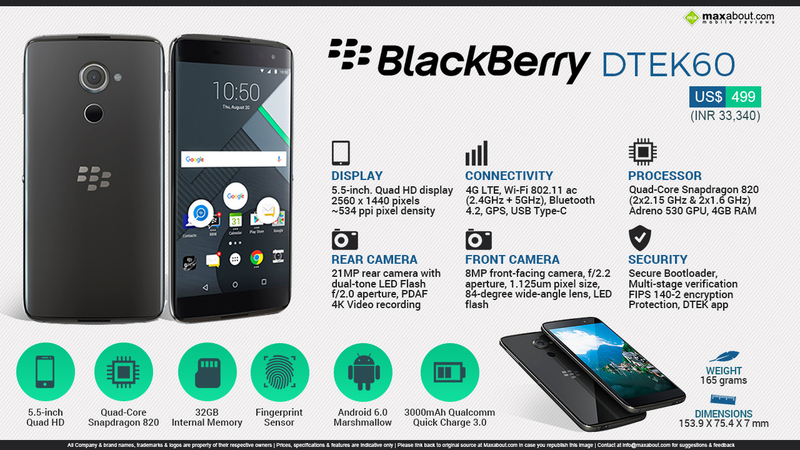 Blackberry is back into the game, this time speeding up with its new smartphone DTEK60. While they considered Android unsafe earlier, the need of time forced Blackberry into the Android OS, customized with their personalized safety features. It has been launched at $499, making things clear that they are not wishing to be the most expensive on the list anymore. Blackberry announced that they will not be into the hardware game anymore while the new launch means they had a device on their mind. Since, software is the point where people consider Blackberry, they simply took the design from TCL handset and built it under the Blackberry nameplate. DTEK60 comes with a 5.5 inch QHD (2560x1440 pixels) AMOLED display, protected by oleophobic coating and scratch resistant glass. With a rich 534 ppi of pixel density, Blackberry claims 71.9 percent screen to body ratio for the phone. It is powered by a Snapdragon 820 SoC chipset and comes coupled to 4GB of RAM. The internal storage is rated at 32 GB while the front and rear cameras measure 21 MP and 8 MP respectively. DTEK60 comes with a 3000 mAh non-removable battery while charging and data transfer is enabled through USB Type-C connectors. It uses Quick Charge 3.0 to get 83 percent of battery in just 30 minutes. Click here to know more about Blackberry DTEK60.